From Bandai Shokugan. The 5th installment of the Gundam Assault Kingdom features the Gundam Exia Repair and 0 Gundam (Type A.C.D) from the 2nd season of Gundam 00. 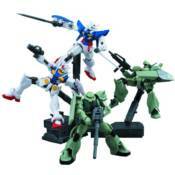 Also included in the assortment are the Jegan from Mobile Suit Gundam UC and the Zaku II. As an added bonus, the Samson Trailer can be built using all the display stand parts included in each set. GUNDAM 1/100 MG GUNDAM 2 GUNDAM 1/100 MG GUNDAM DEATHSCYTHE EW VER. GUNDAM 1/144 FG CHAR'S ZAKU GUNDAM 1/144 FG MS-06F/J ZAKU? GUNDAM 1/144 HG RX-78-3 FULL ARMOR GUNDAM 7TH GUNDAM 1/144 HG SAZABI METALLIC COATING VER. GUNDAM 1/144 HGUC UNICORN GUNDAM(DESTROY/TITAN) GUNDAM 1/144 HGUC UNICORN PEARL CLEAR VER. GUNDAM 1/144 HGUC ZZ GUNDAM 2 GUNDAM 1/144 HGUC ZZ GUNDAMCLEAR COLOR VER. GUNDAM MECHA COLLECTION STAR BLAZER A GUNDAM MG 1/100 ?GUNDAM METALLIC COATING Ver. GUNDAM SHIN KAKUGIN RYUSEIMA GUNDAM SHIN RYOFU TALLGEES /SEKITOBA/TENGYOKUG.